Tyler Niblett decided as a teenager that he had a mission in life to serve and to help others. Tyler’s father, Craig, was diagnosed with pancreatic cancer when Tyler was 14, and died six weeks later after a very short and traumatic battle. Tyler remembers with fondness and gratitude some of the outstanding caregivers who had an impact on him during this difficult time. These health care providers helped Tyler understand and cope with what was going on around him, and they cared for his dad as if he were their only patient. Their passion and skill led Tyler to decide that he, too, would become a caregiver who would make the same impact in the lives of others. At age 16, Tyler became an Explorer with Mobile Fire and Rescue, marking the beginning of his career in EMS. In 2013, Tyler balanced his duties at the fire department with enlisting and training in the Army National Guard. Tyler also started a “Share the Road” fundraiser and organized a 12-week bowling league that raised money to help pay for a family friend’s medical expenses following an accident. When Tyler graduated from high school, he was given the “Heart of a Servant” award, the highest honor given by his school in recognition of volunteer service to the community. The day after finishing high school, Tyler left for basic training and Advanced Individual Training (AIT). Returning home, Tyler registered at Fortis College to obtain his EMT certification and returned to the Mobile Fire Department as a volunteer. 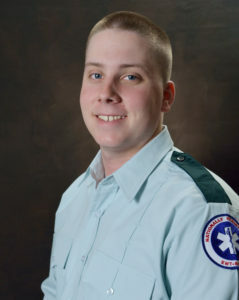 In 2015, Tyler completed his EMT course and passed NREMT on the first attempt. Tyler faced challenges finding a position because he was only 19, and many EMS organizations were unwilling to hire an EMT younger than 21. Tyler did not let this stop him—with drive, diligence, and quite a bit of that Tyler-charm everyone knows, he landed his first position with Newman’s Ambulance. Shortly afterward, Tyler joined Acadian. Tyler will mark his two-year anniversary with Acadian in July 2017. Tyler is enrolled to begin Paramedic training at Acadian’s National EMS Academy and is a volunteer with the St. Elmo’s Fire Department. Tyler serves his community with passion, whether at work, at home, or in volunteer service. Acadian Ambulance Service is proud to recognize Tyler as a Star of Life as well as Acadian’s Louisiana/Mississippi EMT of the Year.